This is 'one of the most choice spots in paradise.' A REAL PLANTATION, The Kaanapali Plantation features mature vegetation, plumeria trees, bananas trees, and a whole array of tropical plants and rolling lawns. A pool, tennis courts, shuffle board, an herb garden are also offered for your enjoyment. There is plenty of free off street parking right in front of the condo which is also wheelchair accessible. Situated on the 13th fairway of the Kaanapali Golf Course North, the plantation is just one block from one of the most beautiful beaches on Maui and near Whalers Village. Enjoy the beach as there are full facilities at the beach park including barbecues, covered cabanas with picnic tables, and bathrooms. Some of the best snorkeling on Maui is featured at this Beach! All the attractions are in walking distance from the condo. Our condo features state of the art kitchen and baths. Two bedrooms, two baths, large family room, and lanai with an unobstructed view of the OCEAN AND THE SPECTACULAR MAUI SUNSETS are here for you to enjoy. You can view the island of Lanai and Molokai from our lanai. There are two new large smart TVs. We offer 3 luxury properties to renters from all over the world. Our condo in Maui is very special and quiet away from the crowds but near all the fun spots and across the street from a beautiful beach park. Our second rental is a room or two in Pacheco Valley, Calif. just 12 miles north of San Francisco and 15 minutes from Sonoma and the wine country. The perfect spot for the true San Francisco bay area experience. The 3rd rental is on Lake Tahoe in Incline Village at the McCloud complex. Close to Hyatt, Diamond Peak and North Star ski areas. The building is one story with no people around. No one above you or below you. No noise or tourists around. There is a beautiful beach park down across the street with lawn and bathrooms and shower along the beachwalk. There is ample parking and bbqs. The views here are spectacular! This alone is a million dollar view not to mention the perfection in the decor. We are on the 13th tee on the Royal Kaanapali Golf Course. So fun watching the golf swings of people from all over the world. There are views of the Island of Lanai and Molokai. The sun set every night right between the 2 islands in full view with colorful sunsets. This condo has the best view of the ocean right from your dinner table. Overlooking the golf course, it is oh so quiet and serine. Paradise at it's best. No noise and a beautiful topical experience. Having cocktails on the lanai watching the mystic sunsets every night will be the highlight of your trip. There are bathrooms and large shaded cabana with tables and chairs for your use. Would rent it again tomorrow! Quiet, away from the kids and noise of Kaanapali beach, but still convenient to everything. Beautiful view. 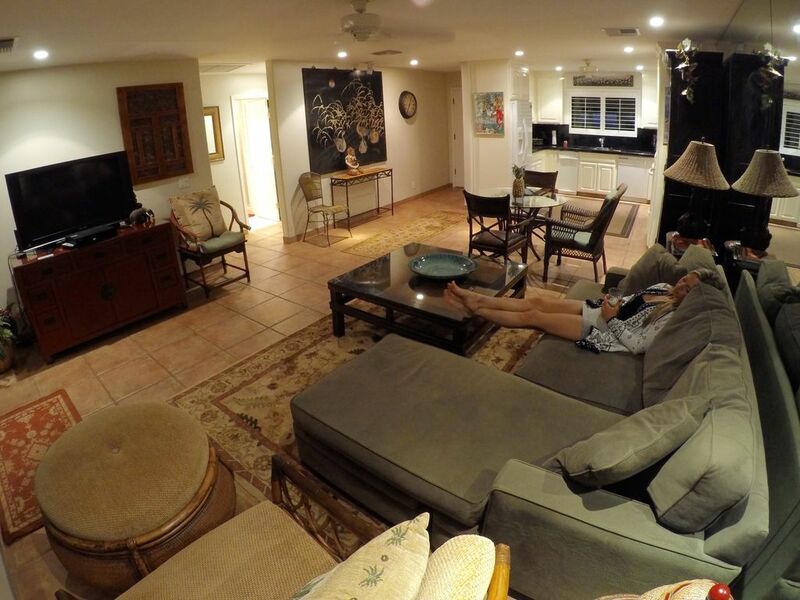 We have been coming to Maui for years and found this condo to be a great value. I would highly recommend it to anyone who doesn’t feel they have to be beachfront. Come back soon and enjoy our Aloha Spirit! This is a wonderful very quiet unit. It is a bit of a walk to the ocean but we had no problem finding a place to park. Belle has just about everything you could ask for there including sand chairs and beach towels. We so enjoyed the sunset over the ocean from our patio and watching the whales. Have some beautiful pictures. The pool is very quiet as well and u had no problem finding a chair. Very central to everything. Would definitely return to this unit. Location is superb. Spectacular view. We always come to Maui on our vacation and we finally found the spot which meets all our needs and wants. We found that being away from the crowds in tropical surroundings is a much more soothing experience. But when we are ready for more action it is very convenient to be so close to all the beaches and restaurants and shopping. Also, if you are a golfer this is your spot for sure. Being on the golf course is so fun and walking and running around is so fun. We will definitely be booking here again next year and we highly recommend this condo to our friends and family. You will enjoy yourselves emensly. We had a wonderful time. The size, location and view was perfect. And the access to the beach was a nice walk away with great reef located near by. Really couldn't have asked for better. If we had to make any suggestion, would just be to suggest some soap (I.e hand soap, laundry soap, dishwasher soap) But that is the only thing, we had a fantastic time and enjoyed every minute. Thanks for letting us borrow your place!!!! Even more impressive than the pictures! Beautiful view! Everything FIRST CLASS! Very peaceful and quiet! Loved sitting on the deck watching golfers yet you can easily see whales jumping! Spotlessly clean! Great view from the deck across 2 fairways on Kaanapali Royal GC to the ocean. Centrally located for Lahina or any other Kaanapali adventure. Beach is just a short walk or drive! Friends were staying in other resorts and said we had the best place by far! They were jealous! Aloha! Mahalo for a true review! The best. Come back and revisit our Aloha Spirit! If you're looking for loud partying, no place to park and lumpy beds - this ain't it. This luxuriously furnished and beautifully appointed town-home is as comfortable and convenient as it gets. Set in a very quiet residential area, it is a pleasant 10-15 minute walk to the beach through manicured lawns (OK it's a golf course) and well cared for tropical flowering gardens. Although the pictures here do the interior and view some justice what you don't see are the whales blowing and breaching in the channel. We were fortunate to be here during their migration and let me tell you that was worth the trip alone. But back to the home - the kitchen has everything you need. The living room area is relaxing and the beds are super comfy. The water pressure is very good and in the master suite shower there is an additional waterfall head. We didn't make it into the Jacuzzi because we spent 80% of our time on the lanai looking across the channel over the whales at the island of Lanai. Incredible sunsets every night. Restaurants, bars and shopping are all within minutes. When we go back this is where we'll be staying. Thanks Belle and Gordon for your generosity in sharing this slice of heaven. We are so happy you enjoyed your stay. Mahalo for your great review! Our condo is at the Kaanapali Plantation on the Kaanapali hillside above Airport Beach. It is on the Royal Kaanapali Gold Course North on the 13th tee. Black Rock at the Sheraton is a short walk down the beach. Whalers Village is also close. Lahaina Town is 3 miles south of our condo. It is the perfect location.